Can you believe that summer is almost here? This year was a huge transition year for us, and looking back on it, it was so good. We moved to a new state, a new school, a new job, and a new way of life. And we lived to see the other side. I am ready for the little break called summer. This summer we have lots of fun things planned. We have camps, sports, and lots of down time on the schedule. Wes and I are also taking our first true vacation away from the kids to celebrate our 10th anniversary. To say that I am excited is an understatement. I cannot wait to spend time on the beach, with a good book, and a cocktail in hand. That being said, I am going to slow down my posting schedule for the summer. Instead of Monday, Wednesday, and Friday, I am going to post once or twice a week. 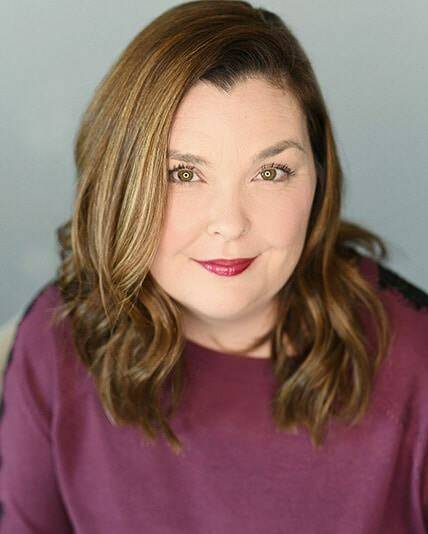 We need some time to refresh as a family, and as much as I love posting three times a week, it is hard to do with the kids home all day over the summer. I want to enjoy my time with them before all three of them head back to school all day in the fall. Don’t worry, you will have plenty of new recipes over the summer, just not as frequently. So, since we are on the topic of summer, I know that it might be strange to talk about baked potatoes. When I make steak, I want a baked potato to go with it. 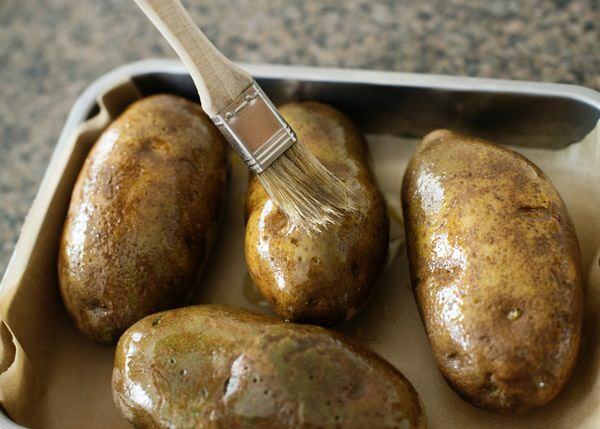 I have tried lots of different methods for baking potatoes, and this one is my favorite. If you do not want to heat up your house by turning on the oven, you can half cook it in the microwave and stick it on the grill to finish it. 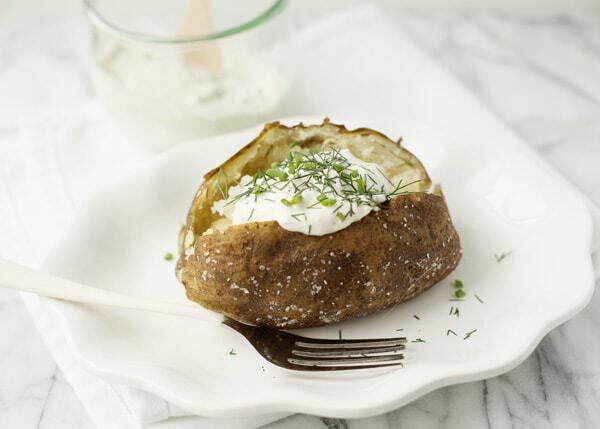 As far as I am concerned, baked potatoes are merely a vehicle for sour cream. 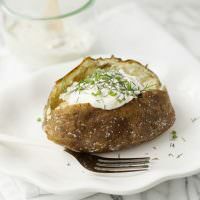 My garlic herb sour cream is my absolute favorite on a hot baked potato. My garden is bursting with fresh herbs right now, so this is a great way to use them up. Preheat oven to 375 degrees. 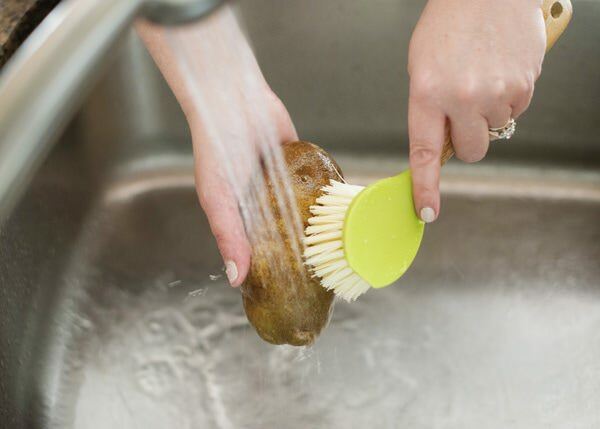 Wash and scrub potatoes until clean. 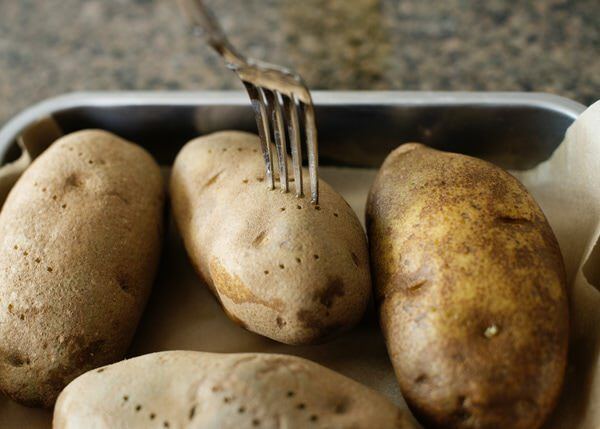 Pierce potatoes 6 to 8 times with a fork. Rub in with your hands or use a brush. Bake for 75 to 90 minutes. The cooking time really depends on how large your potatoes are. Test with a fork for doneness. 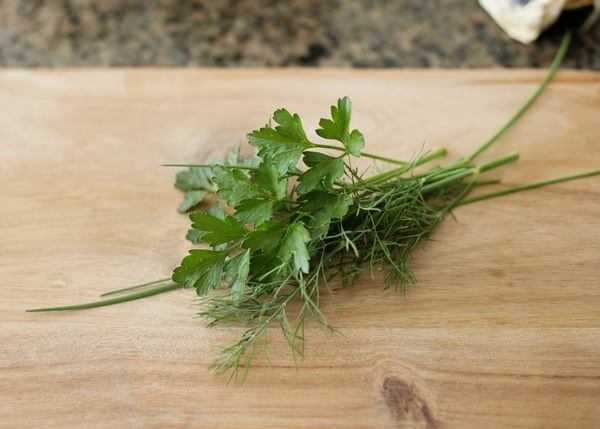 I picked these herbs from my garden. I was was so excited that I actually grew something. Add the sour cream to a small bowl. Add garlic, dill, chives, parsley, salt, pepper, and Worcestershire sauce. Mix to combine. Cover with plastic wrap and keep chilled until ready to serve. 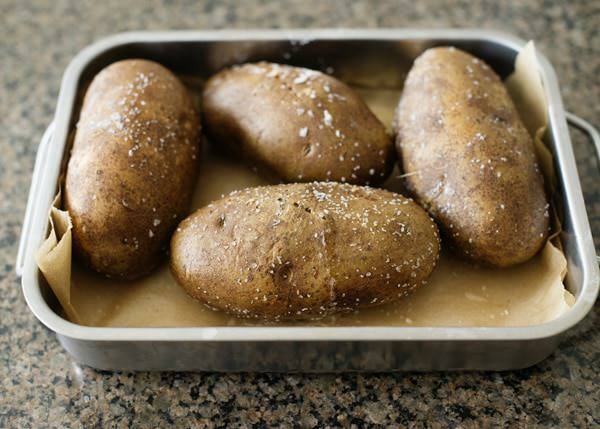 Slice potatoes in half and pinch sides to open. Add garlic herb sour cream and serve. Preheat oven to 375 degrees. 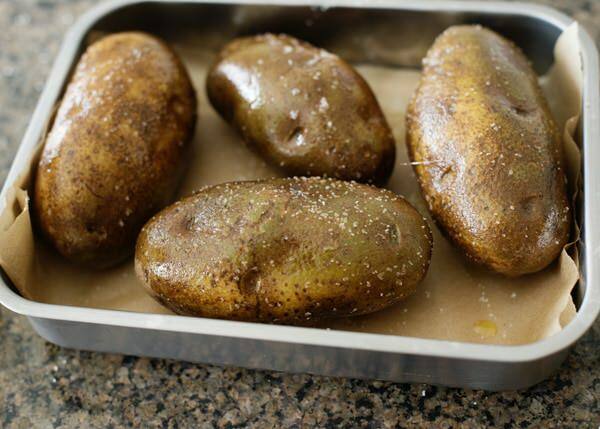 Wash and scrub potatoes until clean. 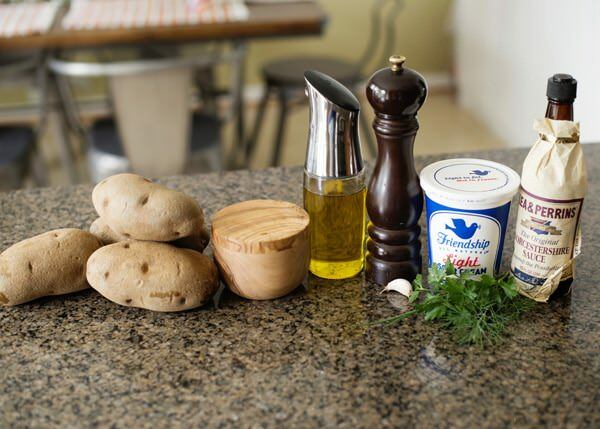 Pierce potatoes 6 to 8 times with a fork. Drizzle with olive oil. Rub in with your hands or use a brush. Generously season with salt. Bake for 75 to 90 minutes. The cooking time really depends on how large your potatoes are. Test with a fork for doneness. Add the sour cream to a small bowl. Add garlic, dill, chives, parsley, salt, pepper, and Worcestershire sauce. Mix to combine. Cover with plastic wrap and keep chilled until ready to serve. 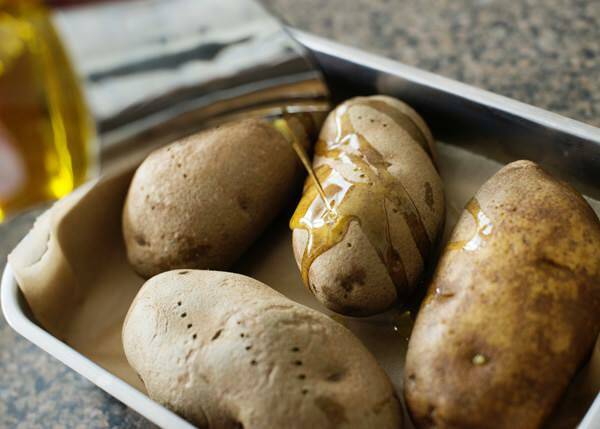 Slice potatoes in half and pinch sides to open. Add garlic herb sour cream and serve. This is one beautiful baked potato, Bree! You are so nice to me, thank you! YUM! what a pretty potato! 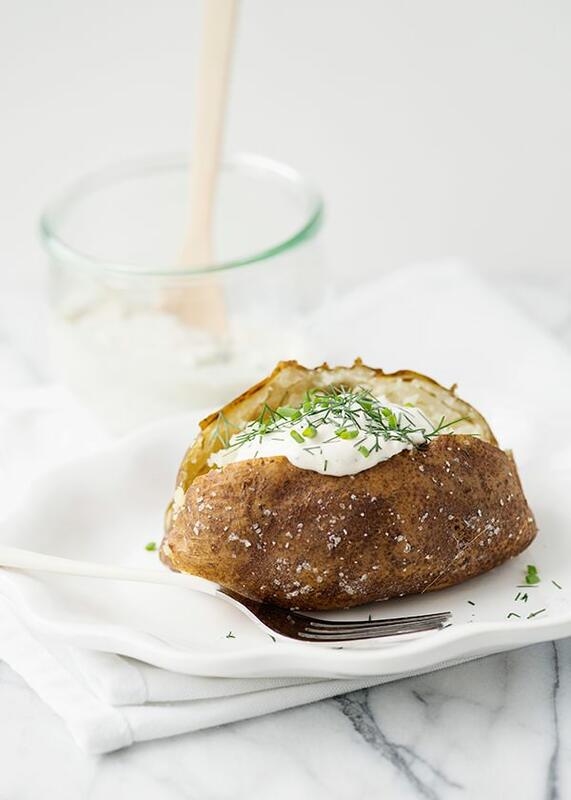 Love potatoes any kind and these look simply yummy! Me too! Love a baked potato. 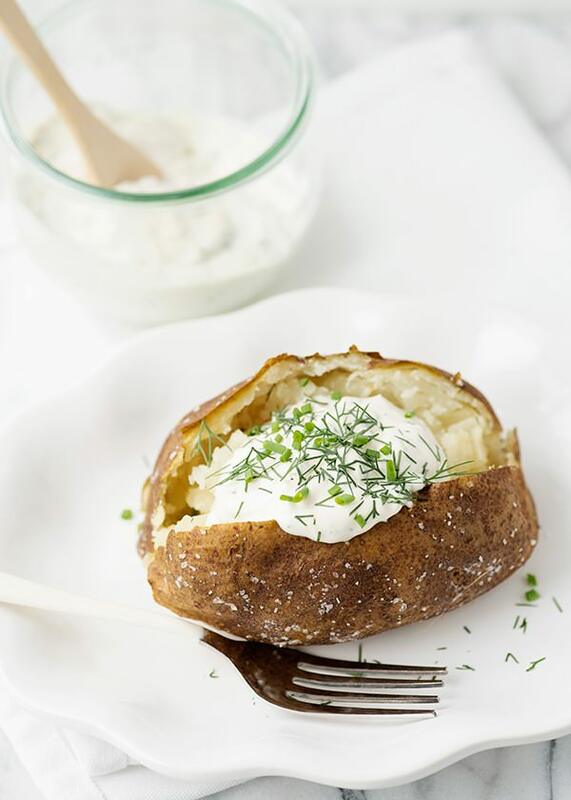 Baked potatoes are my go to meal! Worcestershire..love it. I bet it adds just that little extra something. It does! Hope you like these. What a great looking potato! Love how simple this is! Those baked potatoes sound so yummy! 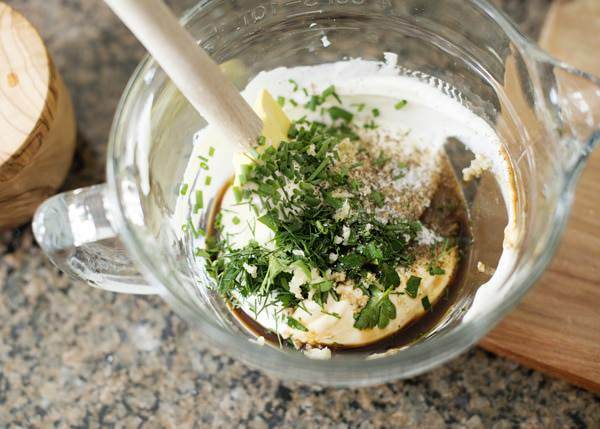 The garlicky seasoning sounds like a great way to take a break from plain old sour cream. Thanks! The sour cream is good on just about anything. 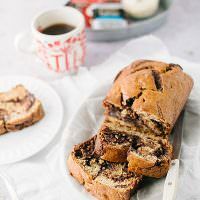 Do you bake them in the pan? Usually directly on the oven grates or on a sheet pan.